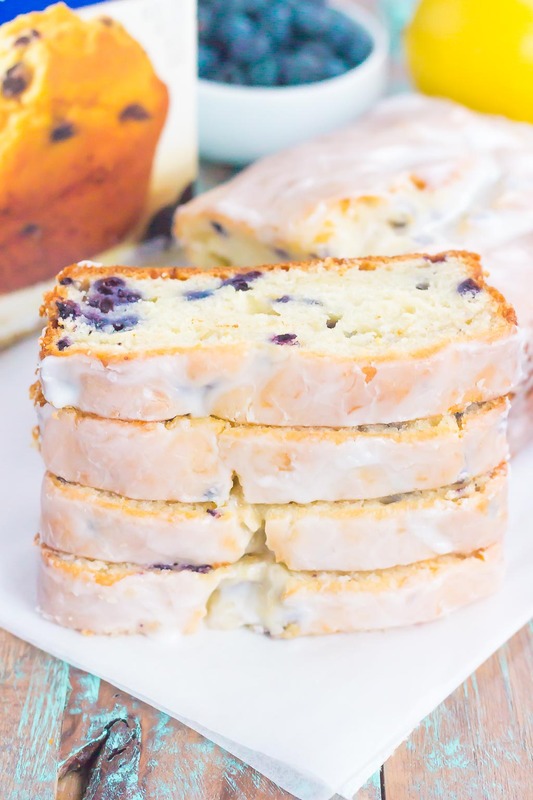 This Lemon Blueberry Bread is perfectly sweet, moist, and simple to make. 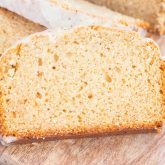 An easy lemon glaze adds a touch of sweetness that makes this bread perfect for breakfast or dessert! Now that we’re three weeks into 2019, how is your year going so far? Are you still tired from the holiday craziness? I sure am! December went by in a blur with family parties, get-togethers, and one too many cookies. And the past few weekends have been crammed too, so I’m ready to relax and settle down a bit. I’ve mentioned this before, but January (and February) are my least favorite months of the year. Mostly because it’s like the arctic tundra here in Chicago, but also because these months just seem kinda blah after the hustle and bustle of the holiday season. We’re still in the middle of winter, with spring (and summer) far in sight. But, I’m trying to work on my positive thinking and am looking forward to what the new year has to offer. A fresh start, new goals, and a year ahead of us that will hopefully be wonderful. When you look at it that way, it’s a little easier to swallow, right? 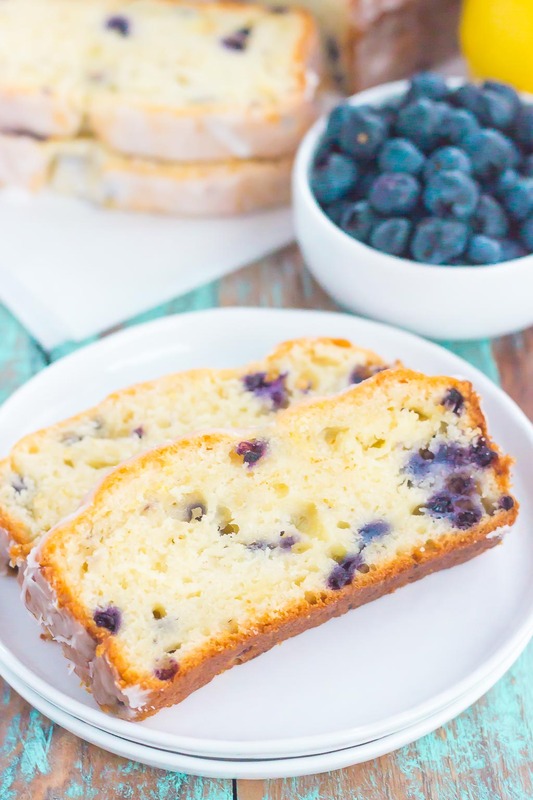 And since I’m channeling those positive, sunshiny vibes today, I thought this easy Lemon Blueberry Bread would do just the trick! I don’t know about you, but there’s just something about baked goods that double as breakfast and dessert that makes me feel all warm and cozy. 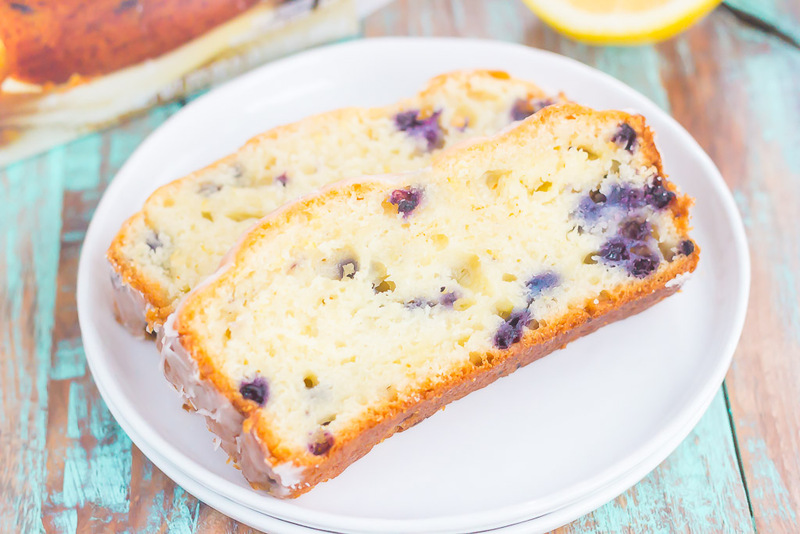 And this simple Lemon Blueberry Bread definitely hits the spot! This bread is made extra delicious and extra easy with the help of Krusteaz. I love using Krusteaz mixes because of their delicious taste and ease of preparation. Remember these cornbread muffins and those chocolate chip pancakes? Yep, all made with Krusteaz and extra tasty! Sweet blueberries and tangy lemon are a match made in heaven. The sweetness of the blueberries and the tanginess from the lemon balance each other perfectly, without out being too overpowering. 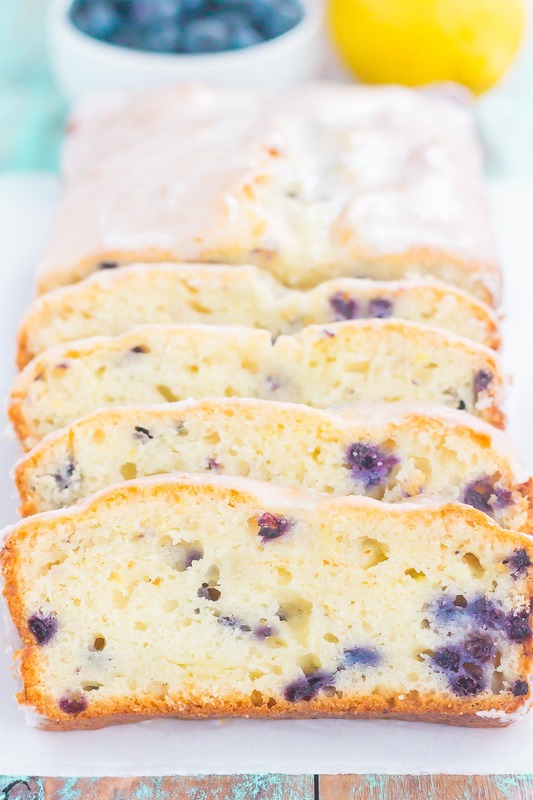 Blueberry lemon bread never sounded so good, right? And because this simple Lemon Blueberry Bread is made with just a few ingredients, you can have it prepped and in the oven in no time. Which means you’re that much closer to devouring it! And let’s not forget about that easy lemon glaze. It’s a simple combination of lemon juice, powdered sugar, and a touch of vanilla extract. It gives this bread a touch of something special. 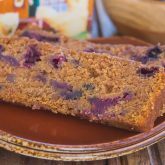 So, if you’re feeling those winter blues and are wishing for warm, positive vibes, this Lemon Blueberry Bread will do just the trick! 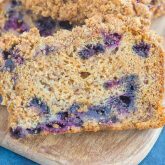 Fluffy, soft, and bursting with flavor, you’ll love enjoying a slice or two for breakfast or dessert! Heat oven to 350F. Lightly grease a 9x5 inch loaf pan with non-stick cooking spray and set aside. Drain and rinse blueberries (included) in cold water; set aside. 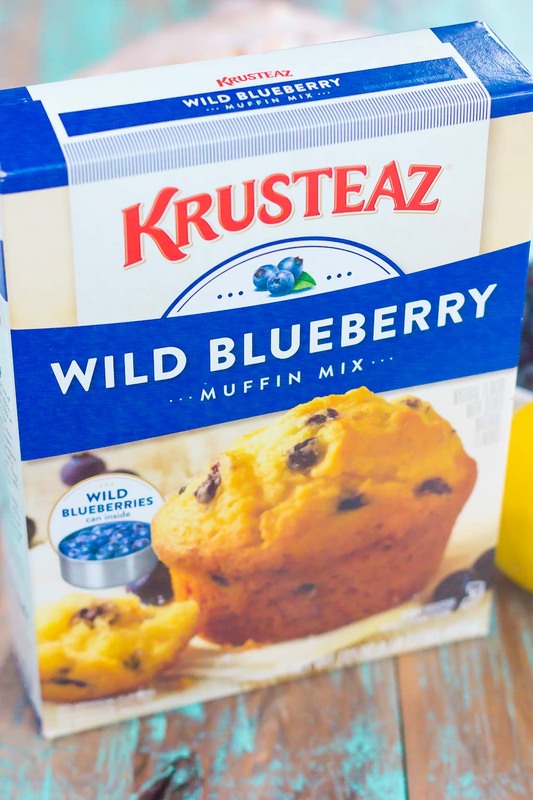 In a large bowl, combine Krusteaz Wild Blueberry Muffin Mix, water, vegetable oil, and eggs until blended. Gently stir in blueberries, lemon zest, and lemon juice. Spread batter into prepared loaf pan. Bake for 48-52 minutes, or until toothpick inserted into center comes out clean. Cool for 10 minutes in pan and then remove to a wire rack to cool completely. To make the lemon glaze, in a small bowl, whisk powdered sugar and lemon juice until smooth. If mixture is too thin, add about one tablespoon more of powdered sugar and whisk to combine. If the glaze is too thick, add 1/2 tablespoon more of lemon juice until it reaches your desired consistency. Glaze should be thin enough to spread, but thick enough to cover as a glaze. Drizzle or spread glaze onto cooled bread and let set until slightly hardened, about 10-15 minutes. 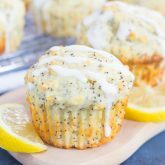 I am a sucker for citrus in my bakes and this lemon bread is right up my street. so good!